This is our list of Standard Garment Inks. Any custom PMS is a fee of $15. + SHIRTS: Standard screen max image size: 14.5 inches wide x 16.5 inches tall. Oversized screen(limit to 2-color prints) max image size: 14.5 inches wide x 20 inches tall. Oversized screens are an additional $15 per screen. + We use 4 pixels of trapping on overlapping / butted up layers. White underbase's are contracted by 4 pixels from the layer overprinting them. + Artwork for regular ink should be 6 pixels wide at 600 dpi (3 pixels at 300 dpi). + We recommend 11" as 'full width' for unisex tees. Wider images begin to wrap around the under arms on smaller tees. For women's tees, 9" usually does the trick. Keep in mind, that if the difference in sizes in your order require us to rescale the size of your art, those items will be considered a different design and billed accordingly. + TOTES: Print size for totes is determined by the size of the tote itself. Artwork must be 2 inches from all sides. By law, all inside labels must have the following criteria for resale: Size, Brand or RN#, Material Content and Country of Origin. + Want your items folded and bagged? This service is $.25 per garment. + Want us to take out the tags? This service is $.25 per garment. (Note, not all garments are applicable). Will light ink on my dark garment show up? Light Colored inks (excluding white) will darken up on darker fabrics. We can use a white underbase underneath these colors to help with the opacity. 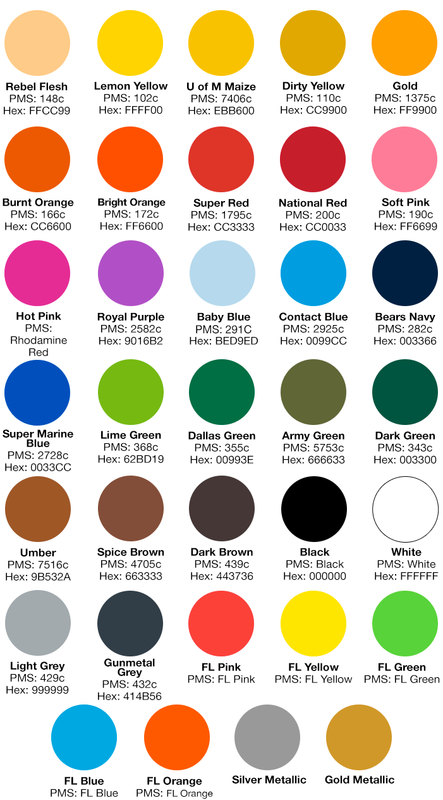 This is charged as another color in your design, if white isn't already being used in your print. What is the advantage of plastisol ink? We use plastisol inks standard for our garment jobs, and it is phthalate free and baby safe! 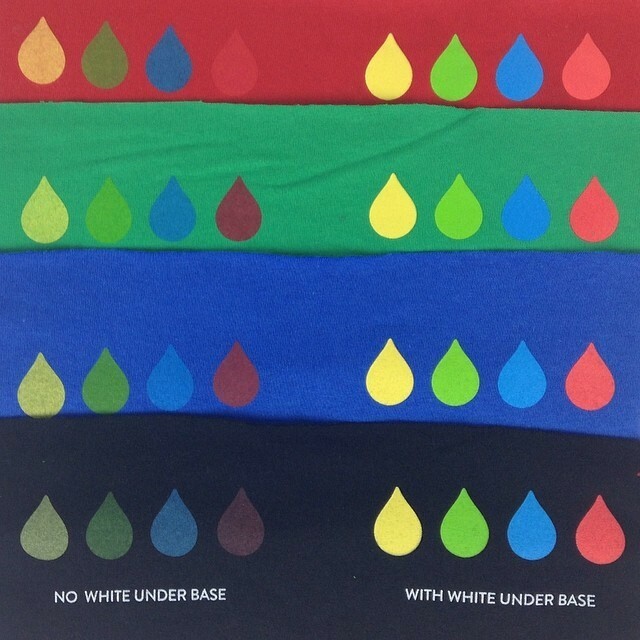 Plastisol ink offers brighter prints that last through many many washes. What is the advantage of waterbased ink? Waterbased inks are much more transparent than the standard plastisol, by nature. The result is a much softer print, that is eco­friendly. Recommended for darker colored inks on lighter colored tees; example ­black ink on a tan tee. 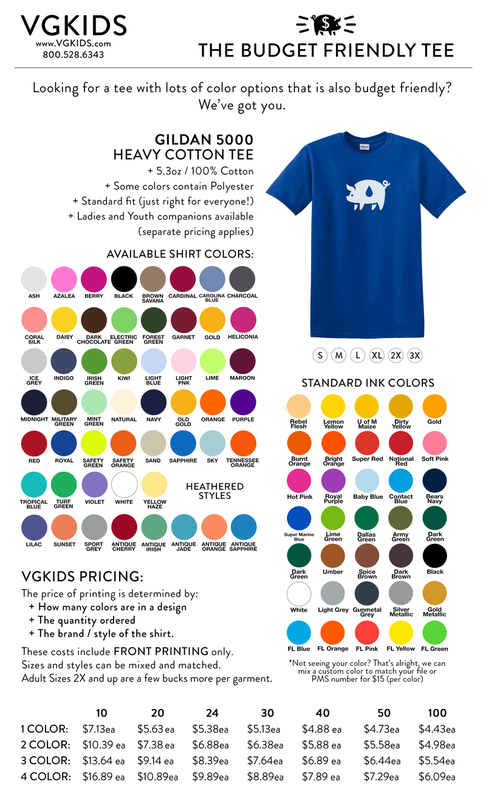 Waterbased inks are and additional $0.25 per shirt, per color and are applied by request. Discharge inks are "water based" in a sense, but they react with the shirt fibers more like a bleach would, dying the garment back to its orginal color before it was dyed at a factory. Because of this, Discharge prints will look different from color to color, and even sometimes from shirt to shirt of the same color. A standard Discharge on a black tee, for example, looks like a light tan. The benefit of Discharge inks is that they are soft to the touch (not a thick, rough patch of ink) and they more opaque than regular waterbased inks. Discharge inks can also have pigmented of any color added to them for a colorful print. Please note, discharge printing is only available on 100% cotton shirts. Can I break my order into different colors & sizes of shirts? Yes, but we ask that you keep the number of different items within a job within reason. A good rule of thumb is that you should have at least 3 items of any size/color combination. 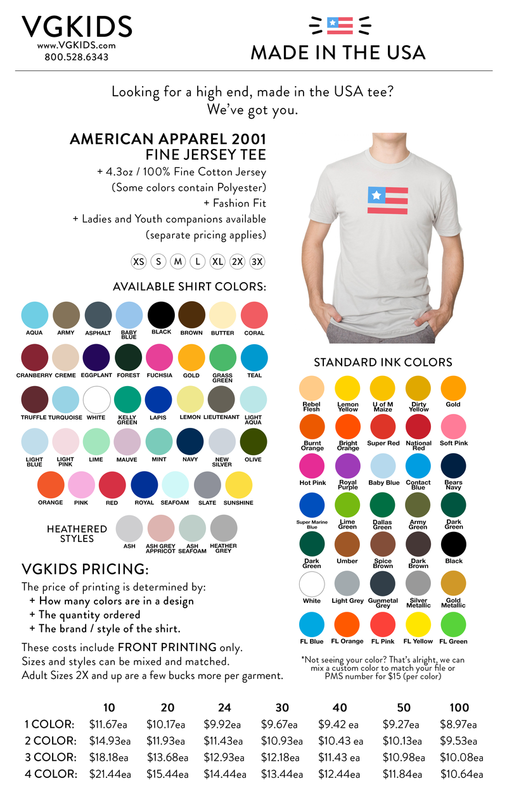 You can also print in one color on part of your order and another for a rest if there is at least 10 garments per color variation, however there is a $15 ink switch fee. Looking to order some garments, but not sure about options and pricing? 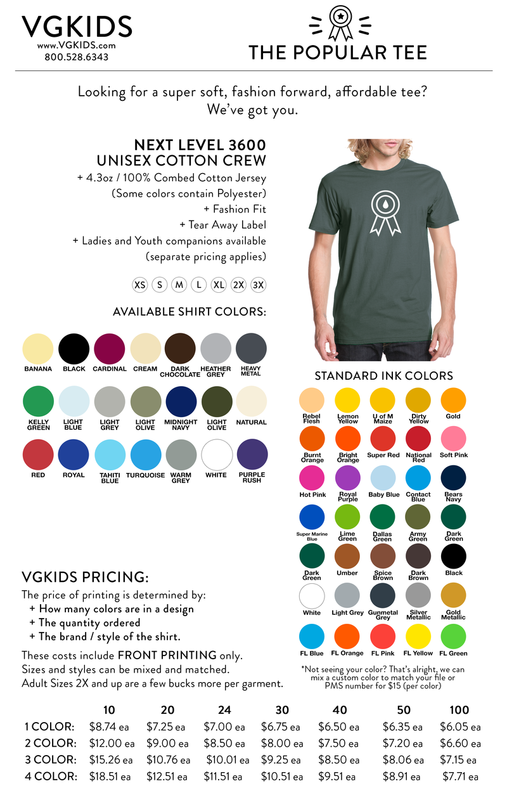 Check out these sales sheets for ideas on all things tshirts!